The nasal septum is the wall between the left and right sides of the nose. It is firm, but bendable, and it is covered by skin that has a rich supply of blood vessels. Ideally, the nasal septum should lie exactly in the center, so that the left and right sides of the nose are of equal size. In about 80% of us, however, the nasal septum is a little off-center, although most of us never notice. Less often, the septum is more dramatically off-center. This is called a deviated septum. In people who have a deviated septum, one side of the nose is wider than normal and one is narrower. This alters the pattern of airflow in the nose and sometimes blocks the narrowed side. In some cases, sinus openings can be blocked, triggering a sinus infection (sinusitis) that lasts a long time or keeps returning. 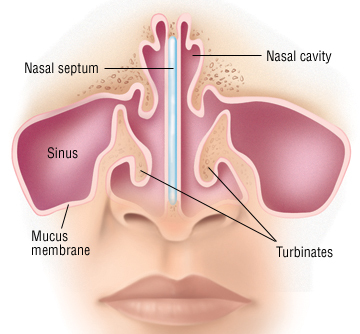 The altered airflow pattern within the nose can cause the skin of the nasal septum to become dry and cracked, which can cause frequent nosebleeds. A pedometer or other "wearable" can track your daily activity so you can determine if you need to adjust your activity level. A simple pedometer that counts your steps is a great place to start.